Yaxley kick off the new United Counties Premier Division campaign with a Friday night match at Harborough Town on July 31. The match is part of the annual ‘National Ground Hopper’ set of fixtures which attracts non-league fanatics from all over the country. Blackstones also take part in ‘Ground Hopper’ as they host Rushden & Higham in Division One on August 1. The rest of the United Counties League kicks off on August 8 with Peterborough Northern Star facing a trip into the unknown to face Kirby Muxloe. 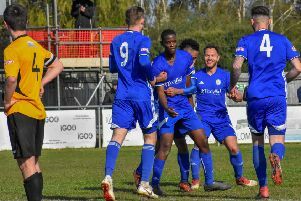 Leicestershire-based Kirby were transferred into the UCL for the first time this season after finishing fifth in the Midland League. Star then host Wisbech in a derby on Tuesday, August 11. Wisbech open against Newport Pagnell at the Fenland Stadium, while Holbeach travel to Desborough. In Division One title-fancies Peterborough Sports will host Irchester on opening day and Bourne entertain Buckingham Town.